This Purchase Order is valid for the internet shop www.ascartuning.cz, determines the terms of sale and specifies the rights and obligations of the seller (www.ascartuning.cz) and of the buyer (customer) in accordance with the provisions of § 1751, par. No. 89/2012 Coll. (Civil Code), as amended. Terms and condition are entered into pursuant of Czech law and of it latest version. These E-shop business terms and conditions (the “Conditions”) govern the legal relationship originating from purchasecontracts between ascartuning.cz, with registered office at Ascartuning s.r.o., Přemyslova 308/125, Mikovice - Kralupy nad Vltavou 278 00, signe at court at Ústí nad Labem, vložka C 19106 (the“Seller”) and the Buyer (which includes both consumers and other customers). If the Buyer is a consumer (i.e. any individual who, outside of his or her business activities or separate course of business, enters into a contract or has dealings with the entrepreneur), then the relations not specifically governed by these Conditions are governed by the Civil Code (Act No. 89/2012 Coll. ), and the Consumer Protection Act (Act No. 634/1992 Coll.). If the Buyer is not a consumer, then the legal relationship based on a contract outside of these Conditions is governed by the Civil Code (Act No. 89/2012 Coll.). consumer and its receipt by the Seller. The Seller will then without delay confirm to the Buyer the receipt of the order through notification to a designated e-mail address; this notification, however, has no effect on the contract. Received orders may be changed only with the express consent of both Parties. 1. Delivery time is established by the Seller in the order confirmation. Delivery is considered complete on the day of the shipment of the order, the day the goods leave the inventory of the Seller, or on the day the goods are ready for collection by the Buyer. On this day, the Seller is then authorised to issue an invoice. The Seller has the right to partial deliveries of goods. Delivery time may be extended in the event of any unexpected issues not caused by the Seller, such as unexpected events of force majeure, strikes, and other obstacles beyond the Seller’s control. The same is true for instances in which these issues may arise with the Seller’s suppliers. In such cases, financial claims for delays do not apply. 1. Purchases through the E-shop require a 100 % deposit in the amount of the order. If the required deposit is not paid within 14 days of the issuance of the order, the respective order is automatically cancelled. The contracted delivery time begins when the entire amount of the purchase price is paid to the account of the Seller listed in the order. 2.1 You have the right to withdraw from the contract within 14 days without specifying a reason. 2.3 For the purposes of exercising the right to withdraw from the contract, you must so inform Ascartuning.cz, tel: +420 774 08 08 05, e-mail: info@ascartuning.cz in the form of a one-page legal transaction (such as a letter sent by post or by e-mail). Return or submit the goods to the Seller without undue delay, within 14 days from the withdrawal of the contract at the latest. In order to comply with the return period, items must be sent within 14 days. Customer will be responsible for all expenses related to product returns. You are only responsible for depreciation in value of items resulting from handling these items in a manner that is inconsistent with the nature and character of the items, including their functionality. that the original packaging is not damaged during transport. Do not send the returned goods by cash-on-delivery (such shipments will not be accepted). – if ordered items include a custom order that is manufactured after the order was submitted, custom to the Buyer’s request for the Buyer himself or herself; such as products with custom upholstery, optional wood stain, or other custom order. Custom orders include items such as any E-shop items marked as “1 – 6 week availability”. These products are not in stock and are always manufactured upon individual customer request and demand. – if the services provided during the product purchase have already been started; such as cover assembly at the manufacturer’s location. approved upon failure to meet any of the conditions mentioned above. Items will subsequently be returned at the Buyer’s expense or stored in the Seller’s warehouse. The handling fee for item storage is 1.5 % per day of the invoiced amount (a fee including insurance of the stored items). must be recorded on the delivery note and confirmed by the haulier, otherwise they will not be approved. The Buyer must immediately notify the Seller in writing of any other defects discovered after unpacking the items. The Seller grants to the Buyer a quality guarantee for the period of two years from the date of delivery in addition to the statutory liability for defects of goods according to the Civil Code. or (b) were used in a manner inappropriate to the functional properties or contrary to the function for which they were designed; and/or (c) were subsequently wilfully altered, changed or joined with other items not supplied by the Seller. Claims will also not be honoured for minor discrepancies in dimensions and colour shades, particularly those caused by the natural character of the materials used. 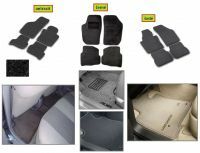 The Seller is also not responsible for claims for regular wear and tear caused by common use of items. 4. Unless the responsibility of defects can be subscribed to the Buyer, the Seller is responsible for defects, and is obliged to repair them. If the Seller proves that he is not responsible for the defect, the Buyer is obliged to reimburse the Seller any legitimate expenses related to repairs, plus a 20 % surcharge. 5. Pursuant to Section 1820, paragraph 1) letter j) of the Civil Code, for claims that were not resolved by the Seller’s claims representatives to the Buyer’s satisfaction, the Buyer holds the right to submit a complaint to the Czech courts, the Czech Trade Inspection, or the respective Trades Office for the Seller’s address. 1. The governing law is the law of the Czech Republic. Application of the United Nations Convention on Contracts for international sales of goods is expressly prohibited. 2. If any of the regulations of the Conditions are in conflict with the Civil Code of the Czech Republic, the respective regulation of the Civil Code shall apply; however, the remaining articles of the Conditions remain intact. 6. These E-shop business terms and conditions are valid as of 1. January 2016, and replace all previously issued E-shop business terms and conditions. Customer have right to start out of court dispute via ODR platform at https://webgate.ec.europa.eu/odr . Only after customer can not succesfully resolve his issue with seller. For the duration of the negotiations out of court settlement would not even begin running and the limitation of the limitation period under the Civil Code , unless one of the parties expressly rejected in the negotiations will continue.